I found it after a long search thanks Crikey! I cant seem to make anim run on my computer! what free program software do I need anyone please? Looked back in time, crikey, some sort of connection between AAO and Ozone though hard to pin down just looking at both, looks good at times other times hard to see really!? Would need to look a lot longer to confirm or deny the connections. as seen on this fabulous !!! animation of this SWELL!! You can clearly see the waves developing like an ocean swell! Probably worthwhile noting that 10 hPa is the approx. the QBO layer . Wonder if there is a phase change underway in the QBO? west to east phase or vice versa? "The saga continues.. The 10hPa layer in the stratosphere appears to be developing quite a wavy pattern of peaks and troughs on the animation. The troughs appears to be warm and the ridges appear to be cool." It will be interesting to see if this wave action transfers to the 200hPajetstream and then down to long wave meridonal troughing at the surface layer at some time soon? Warming in troposphere..or surface of Antartica? Spring could be interesting with disruptions to the Jetstream flow? Looks like it went downwards quite quickly Locke lookin at 500hpa heights 60-90S anoms Thw whole warming I mean. Strange that as per the last time it only seems to affect the eastrn 2/3rds globe(as on the chart) and have a gap of reasonable size along the west longtitudes near south america. Maybe something to do with the standing wave over the s americian andes range which goes well south and disrupts the westerly flow? looks like Rossby Waves there at 45 to 60S! PS By the way Crikey my computer does not work on those animations do you know of a software program that I may be missing to fix that? what what it mean if we had disruptions to the jet stream flow in Spring? 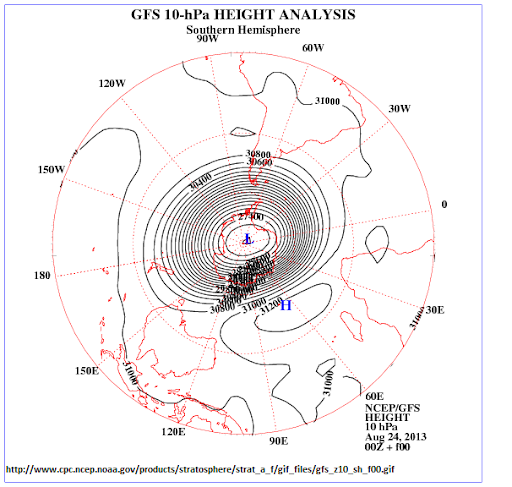 A massive atmospheric sinkhole has developed at 10hPa over Antartica. That means the upper air is collapsing down over Antartica. THis would push air up around the 'well' ? 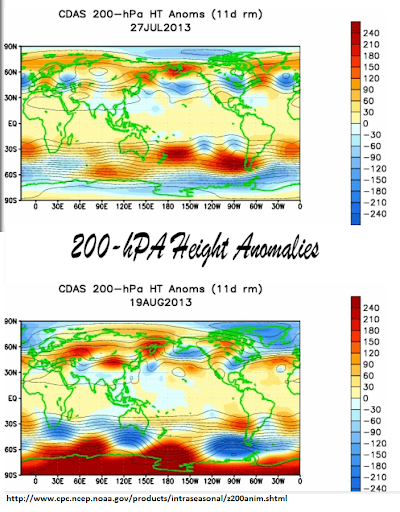 Atmospheric Height low over Antartica and high around southern ocean.? Have a look at the this snap below . The symmetry is incredible. That really is a sink hole. Outer closed height bar is 30800. Chris my thoughts on the implications of this sinkhole. The collapse of the air layer over the Antartic is a significant perturbation. as if someone has dropped a weight in the centre and squashed and displaced the air ? Either way there should be some changes in the vertical and horizontal wave patterns in the southern hemisphere. Extreme anomalies in atmospheric pressure. High and low pressure? If you find anything BD.. Please post..
Great weather watch this one. or is this just a change of season phenomena? I can read all gif files except the animationn does not work stays on first pic always and does not move. I think I need a software file that somehow got deleted from the computer as I used to be able to read them Crikey. Will have to ask to computer wizz son I think! That looks like a meteorological black hole there will have to look and see, never really looked at 10hpa charts previously to this?! It will be interesting to see this will affect our storm season, this could also why we've been having big changes in temperature lately, a week or so ago it felt like late September and within a day or so the temperature dropped like a rock. Earlier posts suggest SSW happening a few months ago, would that have caused all that nasty cold weather in Tassie & N.Z early august? If so, would this extreme depression herald another bad cold snap end of next month for Tassie & N.Z? I'll be in Auckland end sept with son#2 playing league, hopefully NOT in snow! Hey BD. That's a nice symmetric temperature pattern of the 100hPa temp you have snapped there. That warm donut area anomaly is at the Jetstream level ...Interesting to see how this will pan out.. The temperature pattern is as you would intuitively expect. The sinking air has to go some where so radially pushes air up around the periphery of the hole. Warm air from surface pushed up to higher layers at the 100hPa layer around the southern ocean in a donut shape . If strong enough the uplift penetrates up into the upper stratosphere to create some stratospheric warming spots. The effect may be surprising as jetstreams are formed from strong temperature differentials between sub tropical and sub polar 200hPa air. In theory the jet should increase speed and become more zonal. THat would cause less fronts? As the Jetstream is straighter. However the complex dynamics of waves , horizontal or vertical in this situation may create a mixed response? I will say BD. I have had some discussions with REN on Tallbloke blog who seems to believe this is quite extraordinary. With air descending strongly. The pressure over the Arctic should be anomalously high and the pressure over southern ocean rising should be anomalously low..
Maybe cold air from the Antarctic will be pushed northward as the air descends? Some continuing developments. Thanks to BD at weatherzone for his observations and snaps which will include below. Also note .. There was a strong solar storm recently that sent the cosmic ray flux dropping drastically. Some sought of pressure collapse ? Interesting stuff crikey! Anyone have any historical facts of the lowest measured mslp depression marching past tassie & N.Z. ? Keep up the good work crikey. you really are a diligent researcher Crickey - pls keep up the good work, the concepts of this thread (esp the warm area down S uppers) is hard for this ole dummy to keep up with! The BOM CHARTS below give a good idea at what is going on at the surface...strong lows in the westerlies, yes, and high over Antartic area, though this is what normally occurs at this near early Spring time of year, though would not be sure of whether they are normally this low, the low pressure centres I mean.